Endemol are the company behind some of the biggest shows to hit TV in recent years – Million Pound Drop, Deal or No Deal, and Big Brother, the revolutionary fly-on-the-wall show that migrated from Holland, and became a viewing sensation. The show grew and grew, launched a hundred franchises across the world, and led a revolution of reality shows, from I’m a Celebrity, get Me Out of Here to Ramsey’s Kitchen Hell. Ever since then, pop culture has not looked back and the format has become something of a bore. It’s that original show, Big Brother, which has been adapted into an online game from Endemol’s own slots development team. So it’s a shame that the game, a little like the developer’s other TV tie-ins like The Million Pound Drop slot and the compelling Deal or No Deal - The Banker's Riches slot, is a bit on the lame side. The game, like the TV show itself, tries to cater to all, with betting ranging from $0.01 to $5 a coin, there are 25 pay-lines to be bet on across its five reels. The Wild – the Big Brother symbol – finds a place among reels filled with familiar Big Brother icons like the diary room, cameras, hot tubs, newspaper headlines, and a couple having an argument. The Scatter, meanwhile, is the Black Eye icon. This is Big Brother! You Can Win 10 Free Spins! Three or more across the reels triggers one of three bonus features - a free spins round with 10 spins up for grabs, or the Housemate Task Bonus. 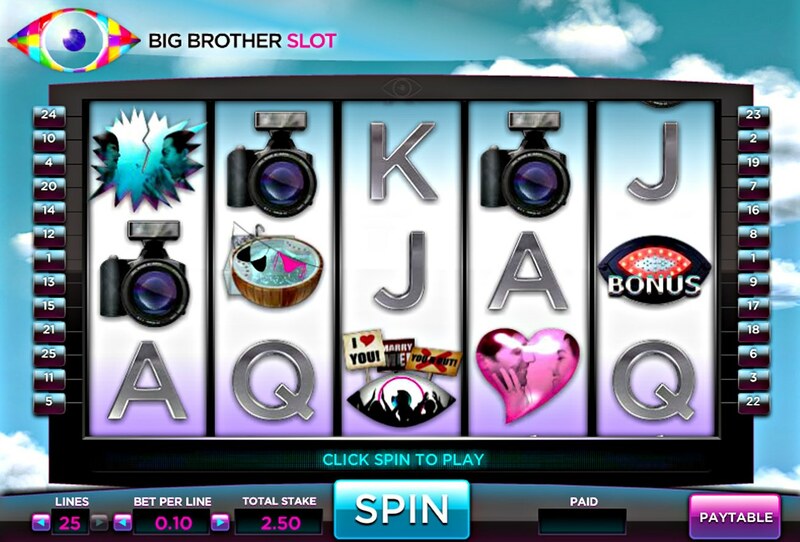 Before taking your free spins, choose three rooms in the Big Brother house to reveal a female or male contestant. Female housemates increase the amount of the free spins multiplier and male housemates increase the number of free spins. In the Task Bonus, it’s a straightforward Pick Me Bonus round, whereby you have to click on various tasks to see how well the housemates will do. The better they perform, the bigger your prize. While the TV format of Big Brother may be slightly past its sell-by date, it’s obvious there are still fans of the show out there, and Endemol will probably attract plenty of fans over to its game. For now, Big Brother won’t be a slot I’ll be nominating for eviction anytime soon.